Recently for class our assignment was to produce in inforgraphic on our own personal branding. I was really surprised to find that there were so many YouTube videos on VideoInfographic’s. I instantly thought they could be really boring, or really informative. I found this one to be really informative especially now that most of us are graduating soon. It talks about how companies are using what we put on Facebook in the hiring process! Some of the statistics were shocking but at the same time not really. I strongly suggest checking out this video! It is only 2 minutes long but VERY informative! We all know and see the power of a hashtag. Hashtags allow social media users connect to an even larger audience all from a computer or cell phone. As my group progresses with out Nonprofit organization, we cannot tell our “boss” Karen enough about hashtags. At the beginning of this semester when we first met with her, she was completely unaware of how many people she could actually reach. Depending on what you say, your hashtag can be very beneficial. 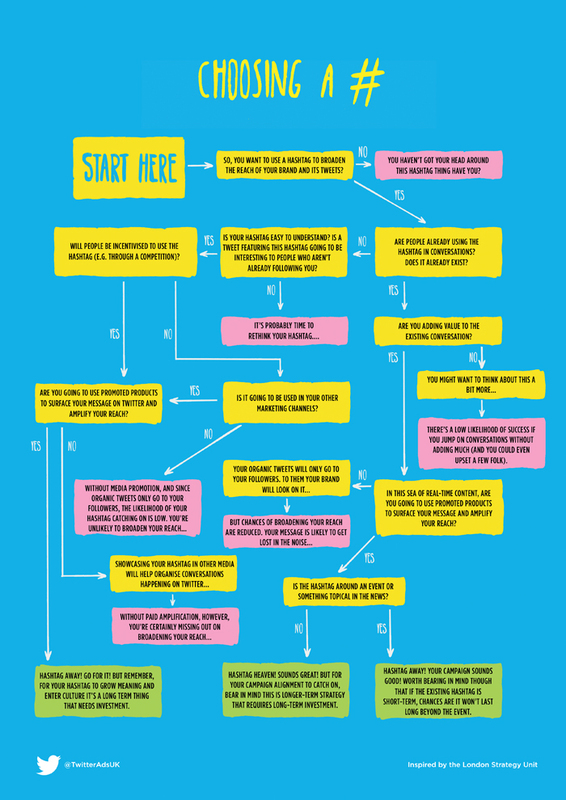 I found a great website that talks about how to better your hashtags and it came with a great graph that talks about choosing the best hashtag for your brand. Only use hashtags that actually benefit your business. Dont just use a popular one to get out there because most of the time people using that hashtag wont care. For example, I would strictly search for and use photography, camera, and or camera accessory hashtags. If people can’t understand what your hashtag meams, they probably aren’t going to use it. Be outright when creating or using a hashtag and make sure that people know what your message is. Avoid the use of vague language or “insiders only” commentary. If you’re using a hashtag to promote your brand without paid promotion, there’s a very strong chance that nobody is going to find out about the hashtag. Hashtags are a great way to get the word out there about your company or your products. Make sure that you are thinking about the customer first and approach your hashtag’s wisely! We all are aware of what happened on April 15, 2013 at the Boston Marathon. Three lives were lost, and 264 lives were changed dramatically. Not to mention now we fear disasters happening at any major event. Just this past week a man began shooting in the LAX airport in Los Angeles, California. Our society revolves around the desire that some have to get their opinions out there fast and in a way that can attract the largest group of people. I have always enjoyed listening to the opinons of the people around me. I am open to different views, and I enjoy talking about the differences and usually we end up finding some similarities. Recently the Boston Redsox won this years world series. Even though I am not a Redsox fan, if my team doesn’t make it to the world series, I tend to pick a team and hope they win. I am not competitive and am genuinely happy when teams that deserve to win, win. I remember exactly what I was doing the day of the Boston Marathon shooting. I was taking an hour and a half spin class at UFC getting yelled at by the instructor to put my phone away. I have friends in Boston. I was scared that they were impacted and was concerned that they were unsafe. Now I am not a HUGE sports fan. I enjoy watching all of them, but usually I am doing other things and never have the time to comprehend what is going on. I understand that we usually grow up loving a team our entire life. I am a diehard Baltimore Orioles fan. I also understand that we have rivals and certain games are bigger then others simply because who is playing who. But that does not give anyone the right to wish disaster on another city. I get it. Its a competitive game. But come on now! Dont say such rude and disrespectful things on social media! HAVE SOME CLASS. I get it. I am not that into sports. And maybe if I was maybe I would be as sassy as some fans. But the Boston incident should not have happened anywhere. Facebook and Twitter are places that anyone can go and see what you post. Have some class. Realize that this COULD happen to us at any time. We cannot predict these moments. But we all can stand together when our country faces a crisis. Remember that what you post on social media IS there for people to see and people ARE paying attention. People and future employers will get a bad perception of you if you constantly post rude things on your facebook wall. I wanted to bring this topic up in hopes of getting opinions. My brother in law and his family hunts every season. Turkeys, ducks, deer. Anything you can they try. His brother in laws dad actually owns a hunting business and takes people around the area on hunting trips. He has created a HUGE business for himself. My boyfriend is also interested in starting and I know a lot of friends that do it as well. Because deer season is upon us, many photos are starting to pop on Facebook, twitter and instagram of the hunter and the dead animal. I have recently been told that people need to stop, and that it is inappropriate and disgusting. If you guys did not realize, Fruitland is an area where a TON of people hunt deer. You probably can tell by the hunting department in Walmart. If you haven’t put it together, you might want to get it together. Is it to much to post these pictures? Obviously people are going to do as they please. They are going to do as they please, I am just curious what some of the opinions are from the students in our class! Its that time of year! We are all starting to see Halloween pictures from parties and events going on around town. Over the years I have personally grown completely out of the whole Halloween thing. I have no interest in it and probably wont be interested in it again until I have kids. This past weekend I was finally able to go home for the first time in a while. My boyfriend and I spent the entire day Sunday doing anything and everything fall related. We got lunch, went to a pumpkin patch and animal farm, carved pumpkins, enjoyed Octoberfest beer, made apple pie, and overall enjoyed an awesome day together. I attempted to carve the Maltese cross, but completely failed. 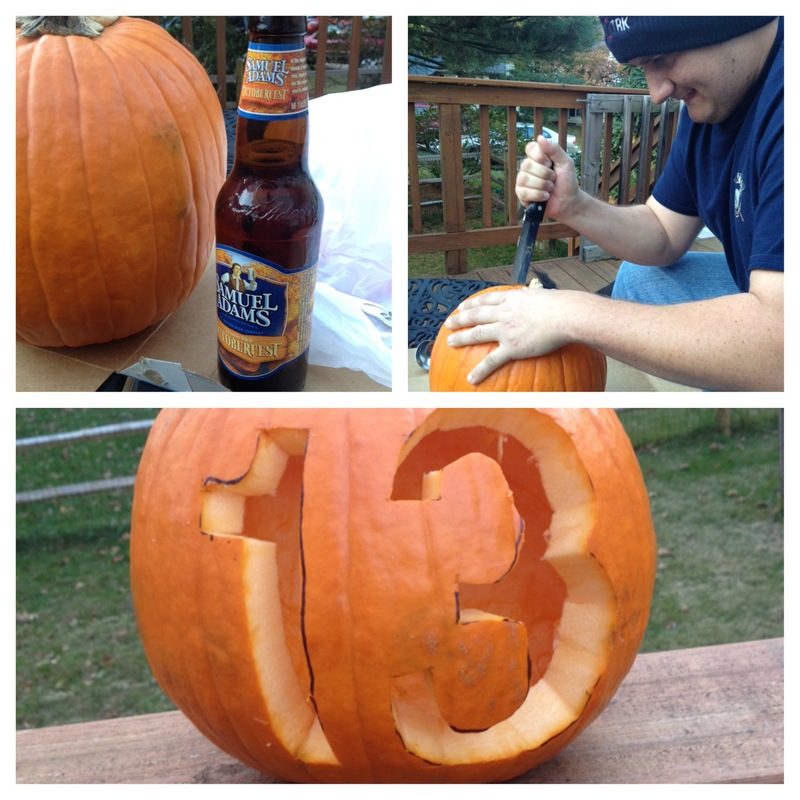 My boyfriends firehouse is house 13 so we went with something way easier. I decided to go into this Halloween wanting to do more decorating then parties and dressing up. This past Sunday I woke up and asked my boyfriend if we could have a total fall day. I really wanted to do nothing school related and just relax. In between pumpkin picking and carving, I needed to pick up dog food for my puppies so we also stopped by Petco. As we walked in, I saw animals EVERYWHERE and advertisements for Halloween dog portraits. The awesome thing that they provided this year was all of the photos would be posted online on Facebook and the companies website! Of course the first thing I thought was I would NEVER want to photograph puppies for a living. Hyper, spunky, CRAZY puppies are NOT easy to photograph. Now my dogs are 4 years old and I know they would NEVER sit still long enough to get a picture taken without being dressed up. I could not imagine being the photographer for tons of puppies waiting for the right shot that could potentially take hours! Being a photographer requires a ton of patience and drive. Making this your career requires you to be even more patient then usual. I just wanted to take a moment to thank all of the photographers that take the time to take photos of all of those not so patient clients. To many households, pets mean more then some of the children in it(Just kidding…kind of 🙂 I have more respect for you then you will ever know! I have written about my sister being pregnant and we actually found out Friday that she is having a girl! YAYYYYYY! Pinterest is now my sisters best friend. She has always been a very indecisive person so trying to decide on a bedroom theme for her new daughter is going to be a challenge. Erin has been on the hunt for a few weeks now trying to find designs for a new baby girl that is not to girly because my sister HATES PINK. And when I say hate, I mean if the color was completely erased from this world, she would never miss it. Pinterest has so many features, even more then many even realize. Erin has found certain post’s from mothers all over the world that have taken pictures and posted them. She has decided on the color grey as the main color, and is now looking for girly designs with purple and yellow. Having that part decided, she has the benefit of being able to take what others have put up and make it her own. These are some examples on her baby board. I could not be anymore excited for my sister and my brother in law. 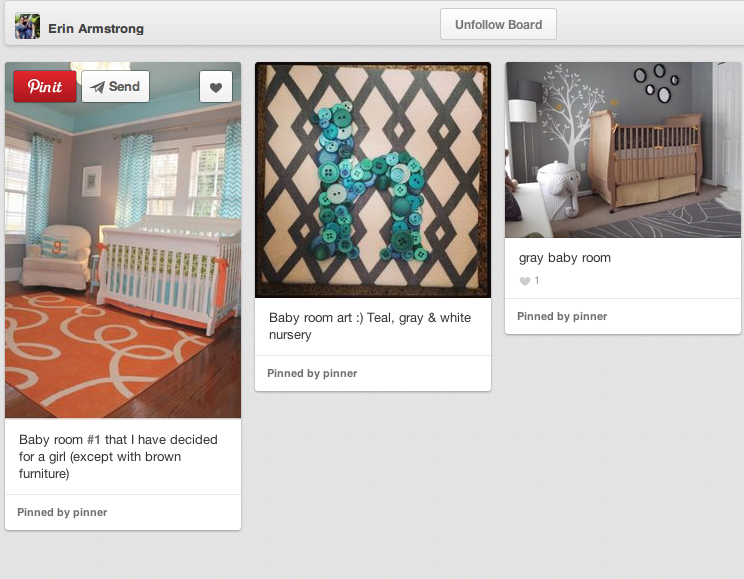 I am even more excited to help decorate for our new little bundle of joy! Are you looking for a scary fun Saturday night?! 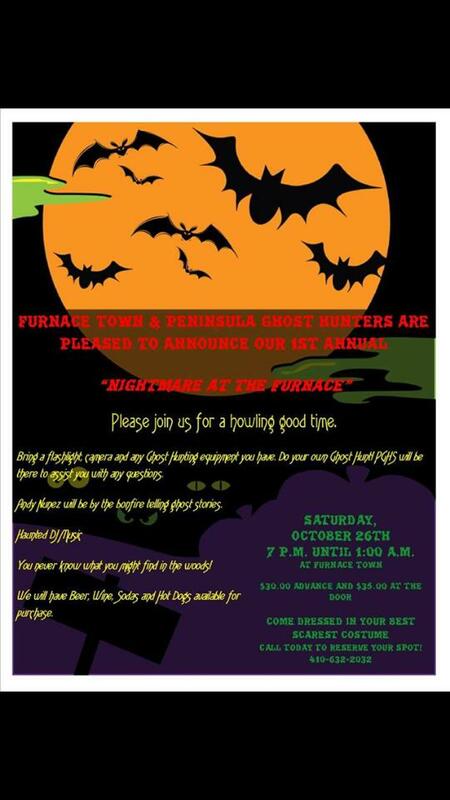 Come on out for a howling good time at the Furnace Town Learning History Museum! Ghost hunts, ghost stories by the bonfire, palm readings, DJ with all your favorite Halloween Tunes, & of course there is a TWIST! You never know what you may find out in the Pocomoke Forest right?! Hot Dogs, Sodas, Beer, & Wine will be available for purchase. Cost is 30.00 in advance through Friday, October 25th and 35.00 at the door. Event will begin at 7:00pm. For more information or to guarantee your spot call 410-632-2032! Come hang out with everyone THIS SATURDAY! Bringing your instagram photos to life!